Jade checks out the giant frogfish on Kontiki. WE KICK THINGS OFF at the Shangri-La Marine Sanctuary (more commonly referred to as “SMS” in these parts). When Scotty’s dive-centre first opened here 25 years ago, the house-reef was a graveyard. Dynamite fishing had reduced the coral to rubble and the fish stock had plummeted. Over time, Scotty’s and the Shangri-La hotel worked together to create a marine reserve, which resulted in a spectacular regeneration of the house reef. Today, SMS is closed to boat traffic and policed by round-the-clock rangers. The reef is in great shape, with table corals standing majestically atop coral bommies and fields of finger coral serving as intricate mazes for playful reef fish. 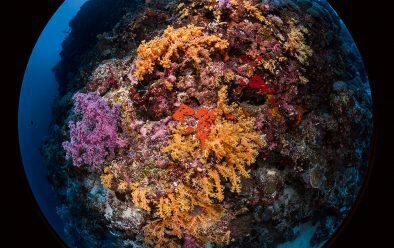 The number of fish has exploded too (in a good way this time), showcasing the rich biodiversity of the region and acting as a vivid reminder that we are indeed diving in the heart of the Coral Triangle. Just below the surface, elongated needlefish glide around our bubbles, their bodies slowly undulating in the search for sustenance. In the shallows, parrotfish and wrasse attack the coral en masse, taking microscopic bites of the least healthy parts; they are an essential component in keeping the reef healthy. Further down, I am greeted by a group of curious midnight snapper, their bodies, dark and dull from a distance, revealed to be ornately patterned up-close, in resplendent shades of gold and blue. Their large eyes investigate our presence. Is it just curiosity, or are they hoping that this large, awkward, bubble-blowing “fish” might help them find an easy meal? Perhaps the most obvious indicator of the successful conservation efforts on SMS is the large school of resident jack. An imposing mass of silver bodies, their schooling behaviour, developed over centuries of evolution, helps protect them from marine predators. However, evolution has not yet caught up with the human factor, and this schooling also renders them an easy catch for fishing-nets. I am optimistic about finding such a big school of fish, just off the beach, barely a mile from the Philippines’ second largest city, Cebu. CONNECTED BY TWO BRIDGES, Mactan is a small island neighbouring Cebu. It played a key role in Philippine history, as it was Lapu-Lapu, its tribal leader, who was the first to resist Spanish colonisation and killed the famous explorer Magellan. In a somewhat odd turn of events, today there are shrines on the island celebrating both Lapu-Lapu and Magellan, a tribute to the mix of cultures and influences that make up contemporary Filipino society and a pleasant cultural break from diving for visitors. SMS is also endowed with a healthy supply of anemones and their accompanying clownfish. In fact south-east Asia is the clownfish capital of the world, home to the majority of the 28 species of anemonefish. I’m not sure that you could ever get tired of these characterful fish – surely once you’re tired of clownfish, you’re tired of life. I have to admit that my camera seems to have a magnetic attraction in particular to the false clownfish species, better known as Nemo and probably the world’s biggest fish celebrity these days. If you’re “small-minded” about marine life, you’ll also find a wealth of potential macro creatures. Network pipefish are present in abundance. Slithering across the coral, their oversized eyes give them a vision advantage to compensate for limited mobility. A clownfish looks concerned by the looming presence of a great barracuda. This is a good spot for fish photography, and one of my favourite games is seeing how close I can get to the hawkfish before they dash away (usually just as you’re about to press the shutter). 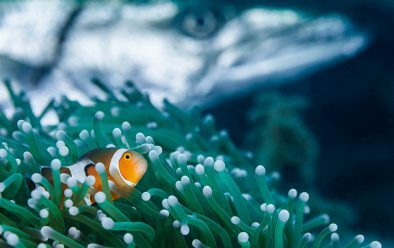 The anemones are not only home to clownfish, but the place to find porcelain crabs and cleaner shrimps living in symbiosis with their host. The shrimp dance in the water column, advertising their services by vigorously shaking their appendages. A lizardfish takes a break from hunting to have its mouth and gills cleaned, opening wide to display the teeth that make it one of the top predators on the reef. The cleaner shrimps eagerly climb inside, safe in the knowledge that the service they offer far outweighs their nutritional value. That night we headed out for my first-ever blackwater dive. Begun in Hawaii, this unusual type of dive is rapidly developing a large following, particularly among underwater photographers. The idea is to partake in the largest migration on Earth, as all the larval-stage fish and creatures rise from the deep to feed on plankton in the shallows at night. We moved into the channel and, in water 500m deep, placed a downline equipped with powerful lights. These attract life, and after 30 minutes’ “cooking time” we slipped into a pitch-black sea. It’s an eerie sensation, suspended over the deep with no point of reference, the downlights and your ears acting as the primary ways of gauging depth. JELLIES DRIFTED TOWARDS us out of the gloom and, as our eyes adjusted, we found tiny fish swimming in and out of the glow of our lights. My camera’s focus system went into overdrive trying to keep up with these tiny individuals. When reviewing the images back on land, we found the recognisable shapes of barracuda, squirrelfish, parrotfish and jack, but at a very early stage of their development. Indeed, many reef fish grow up in pelagic waters, returning to a reef only once they reach sufficient size and maturity. featuring more invertebrates such as sea snails, worms and shrimp. The beautiful wall at Kontiki. In the days that followed, we ventured away from SMS to some of the dive-sites along Mactan’s shoreline. At Tambuli, the contrast between the protected reefs we had been diving and what lay before us was clear. The human run-off, anchoring and fishing in this tourist-heavy spot had clear ramifications for a reef that has more coral-suffocating algae and broken hard coral and far fewer fish. The highlight however was the plane wreck, laid there to entertain divers and acting as an excellent prop for underwater photographers. Once I had exhausted photographic opportunities of the plane itself (or perhaps exhausted my models), I ventured a little deeper, where the reef seemed to be moving. On closer inspection it turned out to be a school of juvenile convict blennies, resembling a group of escaped prisoners in black and white stripes. They swam in unison, poking and prodding at the reef in search of plankton. Research has shown that they mimic the colouring of poisonous catfish in self-defence, and will return to their burrows at night, where they dangle by their mouths from the roof of the tunnels, held in place by mucous threads! Mactan is not just for divers. In this part of the world it’s an easily accessible beach destination, especially popular with Korean and Japanese tourists. Banana-boats and jet-skis abound, and it’s important to be extra-vigilant when ascending in the more-populated areas. This was certainly the case for our next dive site, Kontiki, where sharing the water with hordes of screaming tourists is not really my idea of a peaceful surface interval. Thankfully, serenity was soon restored as we escaped into the deep and along a sheer wall booming with sponges and healthy soft corals. Our guide Bernie purposefully made his way down to a particular clump of sponges at 20m and pointed out a giant frogfish that had been residing there for the past two years. Jade swam in for a closer look, but the current soon made staying stationary for too long uncomfortable. We drifted, marvelling at the wall. With colourful seafans sprouting in every direction, we were spoilt for choice when it came to subject selection. And yet, despite this glorious underwater scenery, we had yet to find the main event. Kontiki is home to a huge shoal of sardines. As our profile edged up shallower, the sun was suddenly blotted out by this mass of small fish. It is a spectacular and overlooked sight, because most people tend to go straight to Moalboal for schooling sardines. Photographically, the sardines pose a real challenge – getting them all in the frame and in a harmonised shape is easier said than done! As Jade and Bernie gazed on this impressive abundance of fish, I searched for that elusive perfect frame. 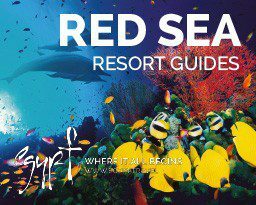 MACTAN PROVIDES for the needs of freedivers and technical divers as well as recreational scuba-divers. Scotty’s is the go-to centre, with outlets in both the Shangri-La and Mövenpick hotels on Mactan. They cater for everything from wannabe mermaids (seriously, there’s a course) to rebreather divers and GUE courses. Founder Scott Livingston is my favourite type of dive-shop owner, one who is still mad about diving and spends as much of his spare time under water as possible. He and his team provided a warm welcome and encouraged us to dig out our technical-diving gear to fully enjoy the wreck of the San Juan. Examining the prop on the San Juan. Situated in Liloan Bay, it was about 30 minutes by bangka from our Mactan base. This old ferry sank in 2000 without casualties, as either the result of bad weather, or, if local gossip is to be believed, an insurance scam. With the top of the ship at 30m-plus you could dive it recreationally but it would be a very short bottom time. 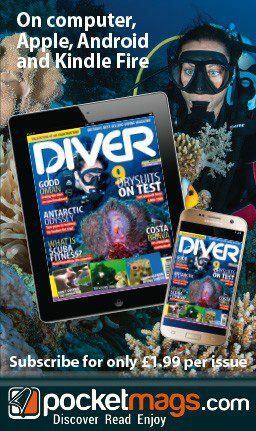 At a maximum depth of 50m, and with the wreck being 60m long, you’ll get much more out of the day by doing a couple of decompression dives with a healthy surface interval in between. Now I’m not one to go chasing depth for the sake of it, but I was very glad we went to the extra hassle of getting down to the San Juan. 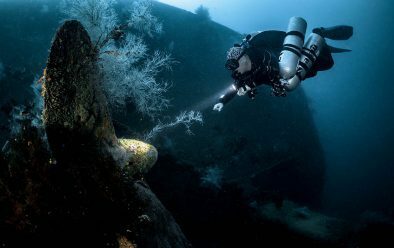 The wreck has become home to schooling fusiliers and, over a couple of decades, has developed into a thriving marine eco-system. With the milky visibility and lack of other divers, I delighted in the sense of adventure and leaving behind the touristy shores of Mactan. It might have been a touch of narcosis but I was buzzing on leaving the water, overjoyed to have partaken in an underwater feature so few have seen. If you have yet to complete your technical dive training but are in search of adventure, your best bet is Marigondon Cavern. We dropped in on a strong current and dived down fast to 35m, where we found the sizeable entrance to the cavern. Once inside and sheltered from the current, we caught our breath and enjoyed the huge seafans adorning the top and sides of the cavern walls. As we frog-kicked into the darkness, our lights startled a big red sponge crab that dashed away awkwardly, bashing about in bewilderment. I couldn’t help but feel a little bad for disturbing this Marigondon resident. BOTTOM TIME WAS LIMITED and we turned to make our way out, the mood changing instantly as we headed towards the blue light at the end of the tunnel. Back up along the wall, we paused to enjoy the vivid soft corals, well fed by a steady flow of nutritionally rich water. 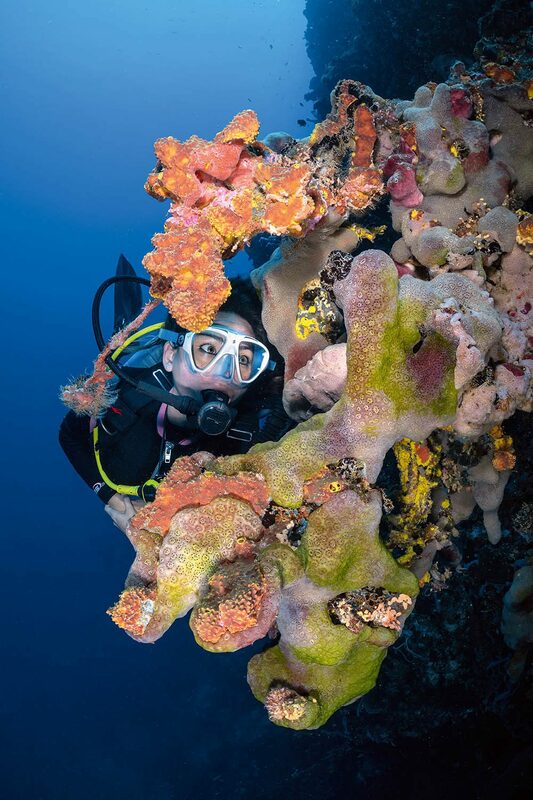 I have been visiting the Philippines regularly for the past decade and, despite a few dives there, was always in a rush to leave Mactan and head for more glamorous diving pastures. Through a combination of factors I ended up diving a lot in Mactan this year, and have to admit to a transformation in my mentality. In the Visayas, you can easily put together an itinerary that includes multiple world-class dive-spots in one trip, and Mactan is worth your time and attention. GETTING THERE> Several airlines fly from the UK to Cebu (with one stop on the way). Cathay Pacific offers competitive pricing and a 30kg baggage allowance in Economy. ACCOMMODATION> Scotty’s is at the Shangri-La, shangri-la.com but a cheaper option on the beach is Bluewater Maribago, bluewatermaribago.com or budget option the Goldberry Suites, goldberrysuites.com. WHEN TO GO> Year-round. High season November-May. June to October is the rainy season, typhoons could occur. MONEY> Philippine peso but US dollars accepted. 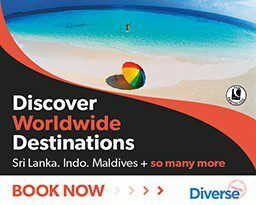 PRICES> Return flights from around £500. 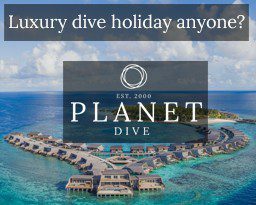 Room rates at Shangri-La from £200 a night, Bluewater Maribago from £100 or Goldberry Suites from £30. 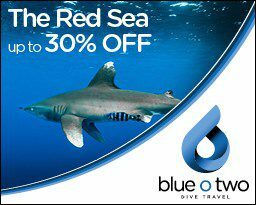 Shore-dive on SMS £32 and a boat-dive £44, package discounts available.